If you're new to CrossFit, returning to working out after some time away, trying to get in shape or trying to optimize your nutrition, you may discover your behaviors outside the gym and your beliefs about yourself are intimately tied to this journey. You may not feel confident about your body, your current state of health, your strength, or your eating behaviors. That's ok. You don't need confidence to start doing something well right now. Confidence will come over time, as a result of consistently making good choices. Right now, you can celebrate each day you show up to the gym or make a healthy food choice, and confidence will grow. Do you want to re-fit into an old article of clothing, get back to "that time when I was fitter and happier", get back to the person you were before you gained weight, or lift the amount of weight you were doing 10 years ago? Ask yourself why. You're no longer that old version of yourself anymore. If you're comparing your current self to a past "better" version of yourself, you're never going to like what you see, because you're trying to get back to someone who no longer exists. Fitness can be a priority or it can take a backseat when other endeavors in your life are more important. Maybe the focus of your effort has been on studying, building a business, managing a family, advancing your career, giving to others - or maybe you're struggling with stress, depression and anxiety. If you're making a change, let yourself truly start fresh. Holding yourself to a standard that is no longer relevant will make it harder to gain any confidence in what you're doing today. Consider asking yourself why you're holding on to the past, and if you're ready to set new goals that are appropriate for the person you are today. As recently as yesterday is already the past, and you can let that person go. You really can. Do you want six-pack abs, a thigh gap, a glute-hamstring tie-in, quad separation, a certain shoulder to waist ratio, a bootie, or some other aesthetic goal? Do you have a vision of yourself on the beach with your family, friends and rivals admiring the cuts, ripples and muscle gains of your physique? These are common aspirations. But these visual hallmarks don't come with just training a lot. They require being below a certain body fat percentage, and the process of getting to that amount of leanness requires consistent precision in your nutrition. Before you set yourself a purely aesthetic goal, ask yourself if you understand and fully accept what is required to get there, and whether you're truly willing to do it. Is it that important? A fitness or skills related goal (run a 10K, do a muscle-up), strength goal (squat 300 lbs, participate in the Open at RX), a nutrition goal (abstain from alcohol and added sugar), a health goal (lower blood pressure or HbA1c) or a mental wellness goal (feel consistently amazing in my skin, love myself) may be better options. CrossFit will address your fitness without too much mental effort on your part. As long as you show up to class consistently and do your best each time, sleep and recover, you will get stronger, faster and more metabolically efficient. However, changes in body composition and appearance, which is what most of us are truly after, require addressing your nutrition. "No matter how hard you train, you can't out-train a bad diet." Changing your eating behaviors is a far more daunting task than training hard because eating is something you have to do several times a day, every day, and for many people, eating is a coping mechanism for some other stress or unhappiness in life, and we are really hard on ourselves about it. We choose to put things in our mouths, and we take that responsibility to heart whether we admit it openly to ourselves or not. Most people at one point or another had a difficult relationship with food or are currently struggling. Our food intake dictates how our bodies function, which results in our energy levels, which results in what we're able to do in life, which results in our sense of our accomplishments, and ultimately our self-esteem. We all want to feel accomplished in our lives. But we don't think nutrition is directly related to accomplishment. Instead we think of food and how our bodies look and move, and we have complex thoughts and emotions about our bodies. CrossFit can help you have better thoughts and emotions about your body. You can prove it to yourself by seeing how the food you eat results in your performance. 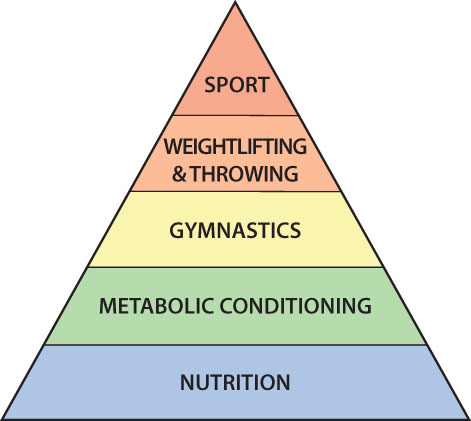 That's why nutrition is the base of the pyramid. Whether it's an addiction to sugar, alcohol, or fatty foods, a habit of restriction or a habit of bingeing, know that many people have negative behavioral patterns related to food, and they are hard-wired with years of reinforcement. This is why it's easier to take on a new, crazy intense exercise program like CrossFit and commit to 3x/week than it is to say no to cookies and cream - why we are able to suffer through thrusters and burpees at 5:30 am but we can't stop ourselves from eating an entire pizza. If you've found CrossFit, you know how to eat for health and longevity, and you have the resources to do so. It's all out there. We know what good nutrition is already. Why is it so hard to consistently do something we know is good for us? Why can't eating just be "fueling for optimal performance", in which case it would be easy? Because we are not machines. Eating is a complex behavior involving feelings of satiation, reward, having control, not having control, coping, comfort, community, alienation, and a whole lot more. It can directly speak to our sense of self-worth, integrity and confidence in who we are, and who people think we are. And it can be a deeply private and potentially shameful part of life that can be difficult to share, especially with those who are closest to us. If your identity has become wrapped around a negative behavior pattern related to eating or drinking (I can't control myself and I hate this about myself), know this: past negative behavioral patterns don't define you. Know that you can change by applying small new healthy habits that will accumulate with dedicated effort. Accept that this may take longer than you think. Saying no to a binge craving or flare of anger and yes to a cup of hot tea and 10 minutes of mindfulness meditation with your phone app (try Calm or HeadSpace) is a new action that requires consistent effort, and it takes time. You won't be successful every time, but sometimes you will be. You can forgive yourself the setback and celebrate the victories. And the victories will slowly outnumber the setbacks. Forming a new nutrition habit is like working towards your first unassisted pull-up. It's a new muscle pattern that has to be trained. Both mental and physical strength are built over time, with progression. The more you train the habit, the stronger it becomes. Celebrate the small steps every day. Be compassionate towards yourself when you're not able to do your best and keep looking forward. Making changes is to put yourself in a vulnerable state. Protect this new vulnerability by adopting a positive mindset. Here's a quote to think about from Ben Bergeron (coach for Katrin Davidsdottir, Mat Fraser, other CrossFit champions): You are what you repeatedly do. What you did in the past is done. What you do today is a choice, and every moment of every day, you have a choice. You may think: "I don't know if I can do this" or "I don't think this is working for me". If you're trying to make big changes, give yourself a chance to sit within this vulnerability. Just going for it is something to be proud of. You do not need confidence in order to start making progress, and don't expect progress to be linear. You can be successful in the little things, which will build into larger, durable habits and behaviors. Then confidence will come. If you'd like to discuss your goals, habits, fears, thoughts on your training, ideas, or if you have questions of any kind, please reach out to your coaches.